Tiny ocean animals that make up a base of the marine food web are ingesting tiny particles of plastic pollution, and that could be bad news for the health of the oceans. That’s the main finding of a recent study published in the journal Archives of Environmental Contamination and Toxicology. 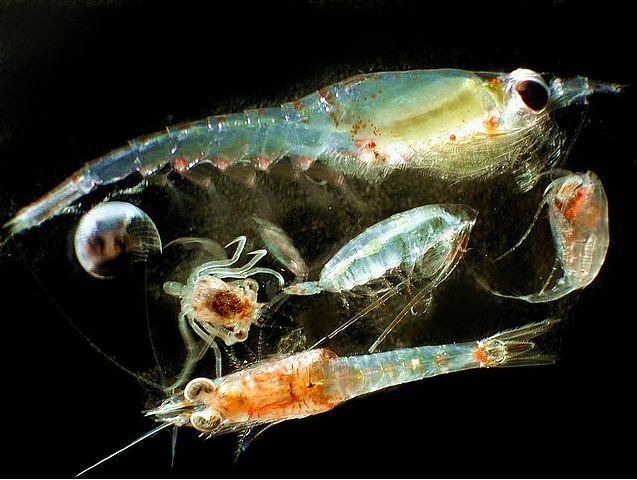 The study focused on zooplankton, a group of organisms that are typically microscopic and that are eaten by small predators like krill, shrimp, and small fish. It looked at two types of zooplankton that live in the Northeast Pacific Ocean — copepods and euphausiids, both of which are tiny crustaceans. It found that one out every 34 copepods were eating tiny bits of plastic, along with one in every 17 euphausiids. The findings represent the first time that zooplankton in the wild have been confirmed to be ingesting plastic, said Peter Ross, co-author of the study and head of the Ocean Pollution Research Program at the Vancouver Aquarium. Previous studies have demonstrated zooplankton eating plastic, but have done so in a lab — a setting that that’s less labor-intensive than going out into the ocean and that’s easier to control. The zooplankton, Ross said, ingest the plastic because they’re looking for something of a certain size — that of a diatom or phytoplankton — and some tiny pieces of plastic fit the bill. The study focused on microplastics, tiny particles or fibers of plastic that are either manufactured to be small – microbeads in face wash, for instance — or that entered the environment as larger pieces of plastic but that have been broken down into small fragments. Both kinds of microplastic are widespread forms of pollution in the ocean — the debris has even been found in Arctic sea ice — but in this study, the plastic found in zooplankton didn’t include manufactured microplastic. The study didn’t look at how zooplankton are affected by the plastic, but Ross said in a statement that the plastics could potentially block up the zooplanktons’ guts or leach into their bodies. And the transfer of these microplastics up the food chain is worrisome to Ross. The study notes that previous studies have found reproductive impacts and other health effects in marine organisms that have consumed plastic. The transfer of these plastics up the food chain, as zooplankton are eaten by larger creatures, is also worrisome. “We’re concerned, obviously, that this is a way in which even if you’re a salmon and you don’t deliberately target a piece of plastic, you’re going to get exposed as a result of feeding on zooplankton,” Ross told ThinkProgress. Baby salmon that spawn in British Columbia’s rivers and head out to sea once they’re mature enough will likely consume between two and seven particles per day just from eating zooplankton, according to the study. And a humpback whale, the study’s authors write, eats 1.5 percent of its body weight in krill and zooplankton every day, which means it would be ingesting 300,000 microplastic particles on a daily basis. This isn’t the first study to examine the impacts plastic pollution is having on zooplankton. A 2013 study also found that, along with the phytoplankton and floating and other, smaller zooplankton that typically make up their diets, the tiny marine animals were eating microplastics. That plastic addition to the creatures’ diets could “negatively impact” their health, the study concluded. Manufactured microplastic has been the subject of substantial attention lately, as scientists warnof the harm they pose when they make their way into the world’s oceans and lakes — mostly to creatures, like plankton, that mistake them for food. Several states have heeded scientists’ warnings. Last year, Illinois became the first state to pass a statewide ban on microbeads. Since then, six other states, including Wisconsin and New Jersey, have passed bans on the plastic. But microbeads are only a small portion of the ocean’s massive plastic pollution problem. A study earlier this year found that in 2010, countries around the world contributed eight million tons of plastic to the oceans. That’s a lot more trash than has been measured so far in the ocean’s “garbage patches.” And, the study found, that amount is supposed to only increase in the next decade if the planet doesn’t seriously address its waste practices. Larger animals than zooplankton have also been found to eat plastic, thinking that it’s food: baby albatross have been found with bottlecaps and other plastic debris in their guts after dying — pollution that’s fed to them by their parents. Sea turtles, too, are known to eat plastic bags, likely mistaking them for jellyfish. ← Yay! Our solar system family portrait is now complete !